SunGlo Window Film’s is proud to be Colorado’s representative of the premium solar window film brand V-KOOL. 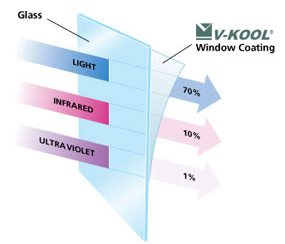 V-KOOL is known for high performance window films that carry GORGEOUS optical clarity. The flagship product, VK-70, is a virtually CLEAR window film that blocks 55% of the incoming Total Solar Energy including over 90% of heat causing Infrared Energy. V-KOOL products are produced using precious metal (i.e. gold & silver). These unique manufacturing materials lead to a VK-70 film that is less reflective than clear glass (8% Visible Light Reflected) and an absorption rate that is well within tolerances even at high altitudes (<40% Total Solar Energy Absorbed). In simple terms, with V-KOOL solar window films, SunGlo can give you solar heat rejection & harmful UV protection on par with darker, metalized films while hardly altering the look of your windows. VK-70 & other V-KOOL products are perfect for homes with large windows & gorgeous views that need protection but should not have the view interrupted. These products also fit perfectly on commercial buildings that must have clear windows for customer or employee views but are getting hammered by solar heat & UV.